Ras al Had Turtle Reserve and the Heritage Site of Ras al Jinz is part of the Tentative list of Oman in order to qualify for inclusion in the World Heritage List. The museum is 3h from Muscat with the Qalhat WHS a decent picture stopover. You obviously need a car for getting here. The resort is a very VERY expensive hotel, and the rooms are very basic. I thought hard about staying nearby and just arranging a timeslot but the emails were not returned and after calling them I still wasn't sure what is going on. I went ahead and booked the hotel to guarantee a night viewing slot and THEN the email for answered. As a guest your visit is included. I know now that not everyone got to go who wasn't a hotel guest. It was low season so they don't have enough turtles attempting to lay eggs and the max seems to be 3 groups per female with maybe 20 people per group but so many people showed up at the lobby to see it there must have been 200. Honestly the turtle laying eggs were disappointing and some tourists just kept creeping closer for pictures (that will look crap anyway as there is no light and no flash) which disturbed the turtle mama and she left...great! As a hotel guest you are in group 1 and out first but the other two groups catch up soon and you get zero benefit for being a guest. Not that I want VIP treatment but after all I splurged for something, right? Not even the museum was free but it was quite interesting and worth a look, audio guide included. I also disliked how the guides carry baby turtles around and release them for the tourists. It seemed so staged, well, because it was, and I'm not sure these were freshly hatched. Early morning you can have another look at the beach before 5am. The walk to the beach is quite a stretch. This is only for hotel guests or at least nobody showed up for it who wasn't. One is supposed to see more hatchlings in the morning but there was nothing going on. The beach is long and off season doesn't bring many turtles. Apparently they always have at least one at night tours but you may have to wait for the guides to spot it. In the morning they lead you out and then you can stay as long as you want but as there is nothing going on after sunrise you may as well head back to the hotel for breakfast. If I ever plan on doing it again it would have to be in high season and not as a guest of the “resort”, even driving back to Muscat 3h afterwards is better than staying here. Then again there are some other turtle hatching places in the world I haven't seen so I would prefer going there first. I cannot believe why Oman, having so many natural beauties, does not have any natural WHS. One of the best proposals would be turtle reserves of Ras al Had and Ras al Jinz. From all beaches of the Indian Ocean, this is the place most liked by female turtles to lay eggs. Turtles come there all the year, but the best period to visit is summer. In winter, if you are not lucky, you may not see any turtles. I was there in February and, fortunately, there were six turtles on the beach. The walks are organized in the night at about 10pm and at 4am in the morning. 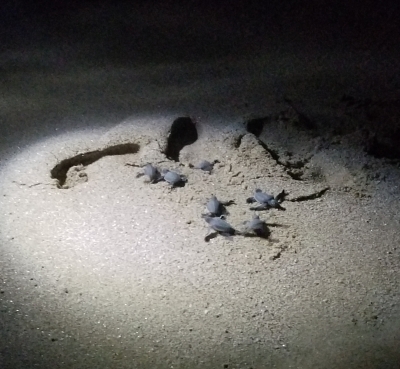 I participated in the night one and was lucky enough to see one turtle during laying eggs and then burying them in sand, but could not see the best part of the attraction, when little turtles hatch from the eggs and go to the sea. Nonetheless, the experience was wanderful. The turtles are enormous, even more than 1m in length! For me, it is must-see place in Oman.